Reports: Dodgers will pay $18 million of Matt Kemp’s salary in 2015. The Dodgers and San Diego Padres are scheduled to play each other 16 times in 2015. If Andrew Friedman handed Matt Kemp an oversized check for $1 million before every game, he would still owe Kemp money at the end of the season. 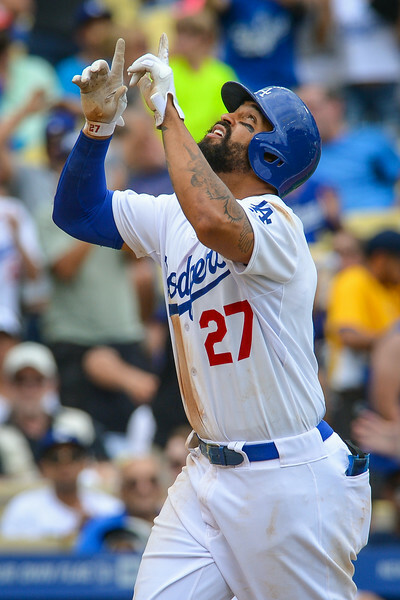 According to multiple reports Monday, the Dodgers will pay the Padres $18 million of Kemp’s salary next year, then $3.5 million per year through 2019. Los Angeles will give San Diego six $3 million installments in 2015, payable on the first of each month during regular season, according to information obtained by The Associated Press. The Dodgers owe $3.5 million annually in each of the following four seasons, $600,000 on the first of each month from April through August and $500,000 on Sept. 1. Because of the cash involved, the Padres in effect pay Kemp $75 million: $3 million in 2015 and $18 million in each remaining year. That goes beyond the usual scope of “trading within your division.” In 2015, the Dodgers will be subsidizing the vast majority of a rival star’s salary. This entry was posted in JP on the Dodgers and tagged Matt Kemp, Padres, San Diego by J.P. Hoornstra. Bookmark the permalink.